New video is emerging of Russia’s heavy bomber sorties and naval cruise missile strikes against targets in Syria. This includes some pretty amazing bomb and cruise missile drop sequences and footage showing the bombers’ fighter escorts, which included Iranian F-14A Tomcats and Russian Su-30SM Flankers. The appearence of F-14s operating over Iranian air space is always intriguing, especially for such a high profile mission. It also proves that Russia’s air-launched cruise missiles, at least some of them from its Tu-95 Bear contingent, were launched while over Iran. Although not as surprising as the F-14 Tomcat’s cameo, Tu-22M3 footage from the video above is among the most interesting, as it shows a very “intimate” bomb-drop sequence from multiple angles. It also shows the target that was struck below, or at least what the video wants us to believe was the a target. Still, the target depicted looks almost perfectly ideal for medium to high altitude dumb bombing as it sits in a remote desert and is clearly identifyable by its unique configuration and borders. It very much is a bullseye unto itself. 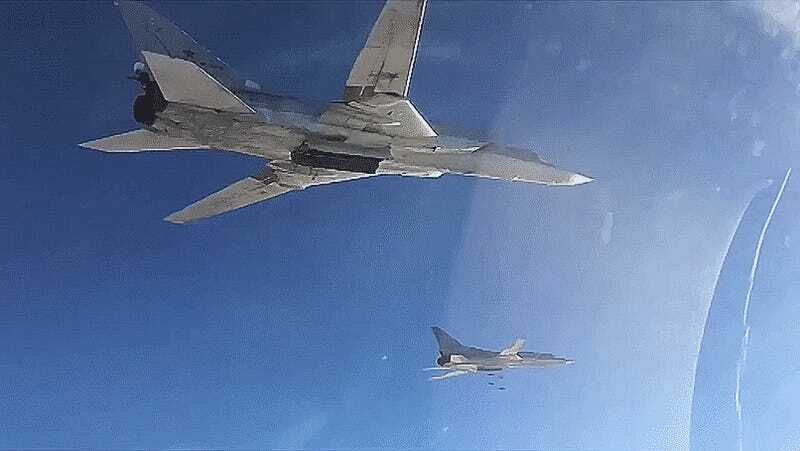 The video below shows the Tu-160 Blackjack, Russia’s most prized air combat asset, along with Su-30SM fighter escorts, launching its cruise missiles supposedly over the Mediterranean. The Russian Ministry of Defense has also disclosed that another salvo of ship-launched cruise missiles were fired again today. This time they emanated from both the Caspian and the Mediterranean Seas. This would have been the first time Russian naval assets fired standoff weaponry at Syria from Mediterranean. Ten ships were said to have taken part, four in the Caspian Sea and six in the Mediterranean. Russia claims the assault killed 600 terrorists. As to how they came up with such a grand number remains unclear. Aside from possibly the Tu-22M3’s direct attack runs on large area and remote targets, these cruise missile strikes are primarily for propaganda purposes. They are all part of one big and expensive dog and pony show put on by the Russian Ministry of Defense. Russia has close to combat fifty aircraft based right in Syria, with all of the fixed-wing portion of the force able to lob dumb bombs on targets. These aircraft also have free run over Syria’s airspace, they are unchallenged by aerial or ground based air defenses. As such, there is no tactical purpose for Russia to launch very expensive cruise missiles, especially stealthy ones like the advanced KH-101, from its heavy bomber fleet. The practice would be almost comical if its true purposes weren’t so ominous. The reality is that these missions are a massive show of force by Russia on a world stage, and are used to spark a war-time nationalist sentiment back at home. They are a reminder that Russia can reliably strike from well over 1,000 miles away with their standoff weaponry. It also underscores the relevancy of their long-range combat aircraft force and these missions are also one hell of a sales pitch to countries looking to obtain similar capabilities. The same can be said for the Su-30SM fighter escorts. There is no threat to the Tu-160 Blackjacks, especially considering they are firing missiles from hundreds or even over a thousand miles away from any conflict zone. Yet the imagery benefits from these modern Russian fighters, prickling with missiles, being in the frame. Even the inclusion of the Iranian F-14s in the most recent video reminds the viewer of Russia’s expanding regional alliances, ones that are opposite the United States’ diplomatic flow. The video above is representative of how Russia has widely embraced the France’s increased involvement in the Syrian campaign since the attacks in Paris last week. Putin himself commanded his naval forces, including the Black Sea Fleet’s flagship, the cruiser Moskva, that is providing area air defense over Russia’s base in Syria, to work with France’s fleet of ships that are currently enroute to Syria in any possible way. This is an interesting move considering the EU placed sanctions on Russia since its invasion of Crimea and the fact that France denied Russia from taking possession of the two Mistral Class helicopter carriers. Although, Egypt, an ever-tightening ally of Russia’s, ended up buying them, and has ordered them to be outfitted with Russian sub-systems and helicopters, just as Foxtrot Alpha predicted. In the end, Russia could very well one day use these carriers as a guest of their Egyptian allies. The move by Russia to bring France closer within its orbit strikes at the heart of NATO once again sticks a thumb in the eye of the U.S., who Russia clearly is competing for influence in the region against. It also may help put Russia’s actions in Ukraine behind it, as dealing with the specter of international terrorism becomes Europe’s highest priority for some European leaders. The hope for many is that the U.S., France, Russia and other players can all get on the same page in Syria and the fight against Islamic extremism. If that were to happen it will require Putin to be the one pulling the strings, which is what he seems to have wanted all along.